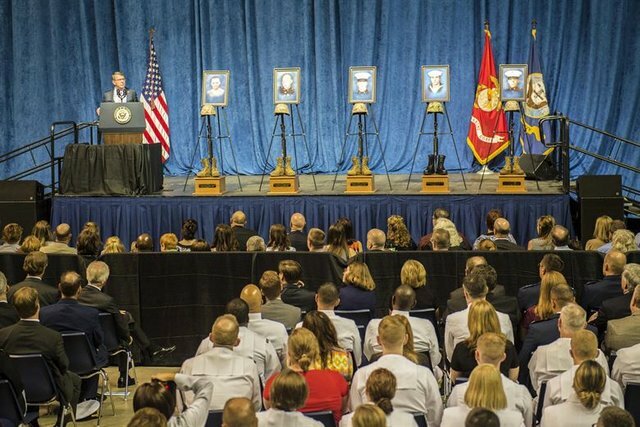 Washington, DC…The lives of the five “fallen patriots” who were killed as a result of the July 16 attacks in Chattanooga, Tennessee, were “truly exemplary,” Defense Secretary Ash Carter said today during a memorial service in that city. Carter joined Vice President Joe Biden, Navy Secretary Ray Mabus, Navy Adm. Jonathan Greenert, the chief of naval operations, and Marine Gen. Joseph Dunford, the current commandant of the Marine Corps who was confirmed by the U.S. Senate to become the next chairman of the Joint Chiefs of Staff, and other officials at the ceremony. The defense secretary praised the service and sacrifice of the slain Marines and sailor. Carter said U.S. leaders take acts of harm against Americans “personally” and will do what it takes to protect the service members who serve and protect the nation. “The few who threaten or incite harm to Americans — violent extremists or terrorists, wherever they are — will surely, very surely, no matter how long it takes, come to feel the long arm and the hard fist of justice,” he said, drawing audience applause. “Those who attempt to inspire fear or terror will find no satisfaction, have no success, in the United States of America. Instead, we come back — we come back from tragedy stronger and more united than before,” the secretary said. Carter said he has directed the military services to fundamentally review their domestic security procedures and take immediate steps “to improve the security and force protection of our personnel. And we will do more if necessary,” he said. Despite the attacks, recruits are lining up to volunteer, “in some cases, more than they were before,” the secretary noted. The vice president told the grieving families their courage is an inspiration to “hundreds of thousands of people across the country who are struggling with their own sense of loss. “I promise you give them hope … America owes you just for being here,” he said. “You’ve lost so much and you’ve given so much,” Biden told them, adding that one day, the memory of their loved ones will bring smiles to their faces. Mabus praised the courage of the slain Marines and sailor, as well as that of their fellow service members, first responders and Chattanooga police officers who put their lives on the line to shield others from the gunfire.